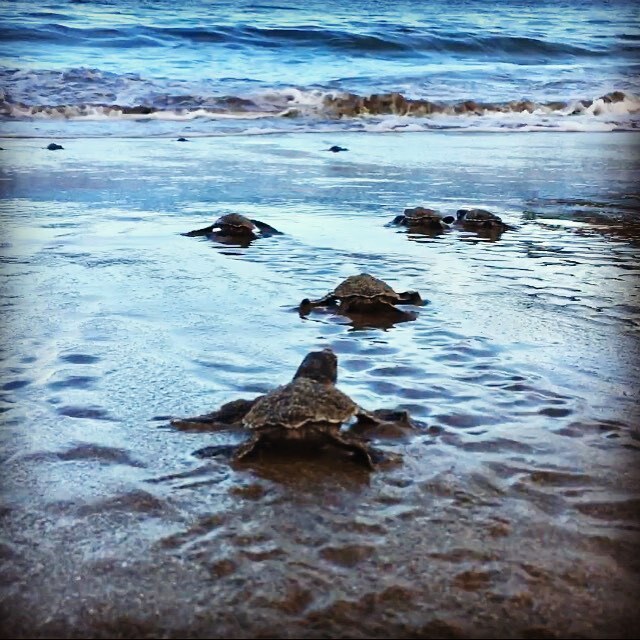 For a one-time fee of $35, $50 or $65, an individual or adoptive party may sponsor, or “adopt” a sea turtle or nest found on one of the many beaches near El Jobo, Costa Rica. These nesting areas and the adult turtles that live, feed, and/or breed there are essential to the survival of three species of Pacific sea turtle: the Black turtle, the Olive Ridley, and the Hawksbill. The Hawksbill in particular is so critically endangered that it is estimated that there are only about 400 breeding females left in the Oriental Pacific Ocean. Turtles and nests will be assigned on a first-come, first-serve basis, with the next species found or rescued being assigned to the next person in the queue. 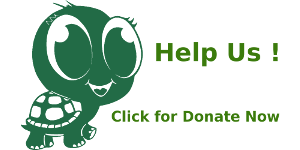 The money from these adoptions goes directly towards funding ETC’s essential conservation activities! Patrolling the beaches, catching and identifying turtles, discouraging poachers, driving injured turtles to the rescue center, marking turtles with tags for identification, and host of other expenses funded by people like you. 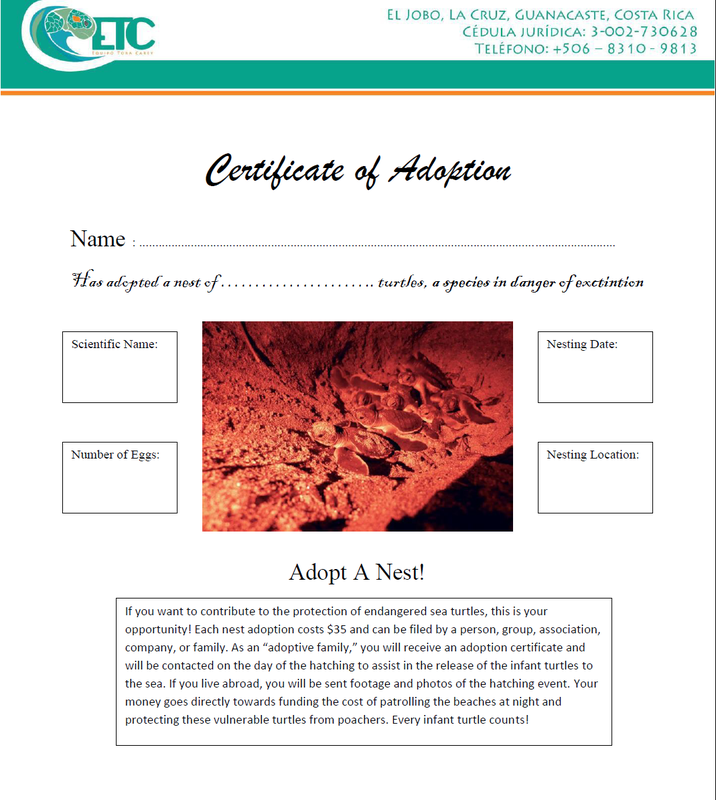 When a turtle nest is laid and identified, that nest will be assigned to a donor for this particular kind of adoption. The eggs will incubate and grow for between two and three months, weathering all sorts of dangers, including poaching, predation, and even being dug up by other nesting turtles. If they do make it through term, however, ETC members will dig up the nest just prior to the estimated hatching date, to ensure the highest survival rate of hatching turtles. Within the next few days, ETC will prepare to release these turtles on their own terms. Turtles will be safely kept in a dark, dormant state until a supervised hatching at night – with minimal light, protection from predators, and, if necessary, human guidance to the ocean. They will then begin their 40-year journey to sexual maturity. 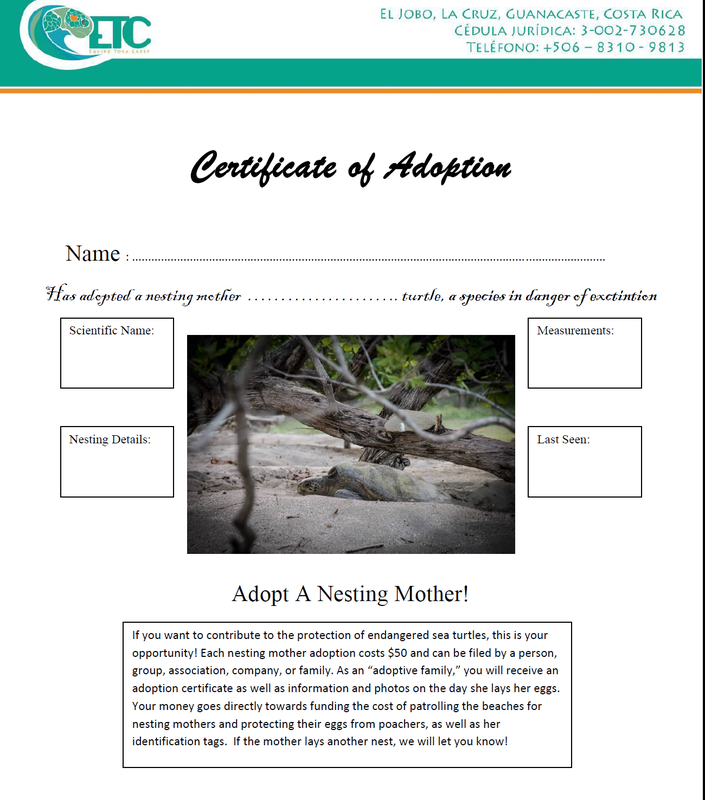 Photos and footage taken during this supervised hatching night will be sent to the adoptive person or family along with a congratulation that their nest safely and successfully hatched. ETC employees and volunteers patrol the beach nightly, monitoring the area for female egg-laying turtles that use high tides and the cover of night to come up onto the beach, dig a hole for their young, bury them inside, and then quickly and silently return to the ocean. Because of shifting tides, these patrols often happen at 12, 1, and 2 A.M. Nesting mother turtles are very sensitive and easily spooked, so their identification and measurements must be taken quickly and quietly with minimal light, immediately after they finish laying their nest and begin their return to the ocean. It is important to tag nesting mother turtles because of their propensity to return to nearby beaches to lay more eggs in the days after their first nest, and because of the lack of data on the breeding and travel habits of the egg-laying females of this species. After the turtle has returned to the sea, the nest is carefully moved and camouflaged to throw off predators and poachers. An adoptive individual or family will be assigned this nesting mother and receive her measurements, tag number, biological information, and the number of the eggs she laid. They will also receive any further updates on this mother’s recapture or re-identification when she lays her next nest. Sometimes, critically endangered turtles bite hooks, get caught in nets, or are otherwise injured by a multitude of fishing activities that ensnare them by accident. Often, spooked fishermen may see the turtle and free it, but hastily cut the fishing line the turtle is hooked on or is trapped in several meters away from the turtle, which can cause a host of other life-threatening problems; the turtle can become entangled or injured by the line dragging from its body. ETC strongly encourages local fishermen to report these inadvertent captures and to contact the organization immediately. 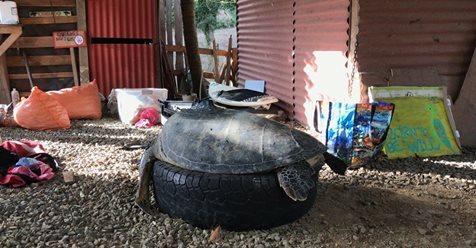 At risk of infection from a wound caused by lines or digestive puncturing or suffocation by tangled lines or a hook in the throat, rescued turtles often have little options in the small fishing town of El Jobo. Often, serious injuries like these require drug treatment, careful nursing in captivity, or even surgery. To get the turtle its required care, ETC will drive to the only aquarium in Costa Rica (which doubles as a makeshift rescue center) and give custody of the animal to the Puntarenas aquarium, which is over a four-hour drive away. Adoptive parties will receive information on the turtle’s background, conservation risk, life-threatening issue, and potential release date. Proceeds from rescued turtle adoptions will go towards the cost of the turtle’s rescue, shipping, treatment, and maintenance at the aquarium, until it has hopefully sufficiently recuperated to justify a release into the wild. 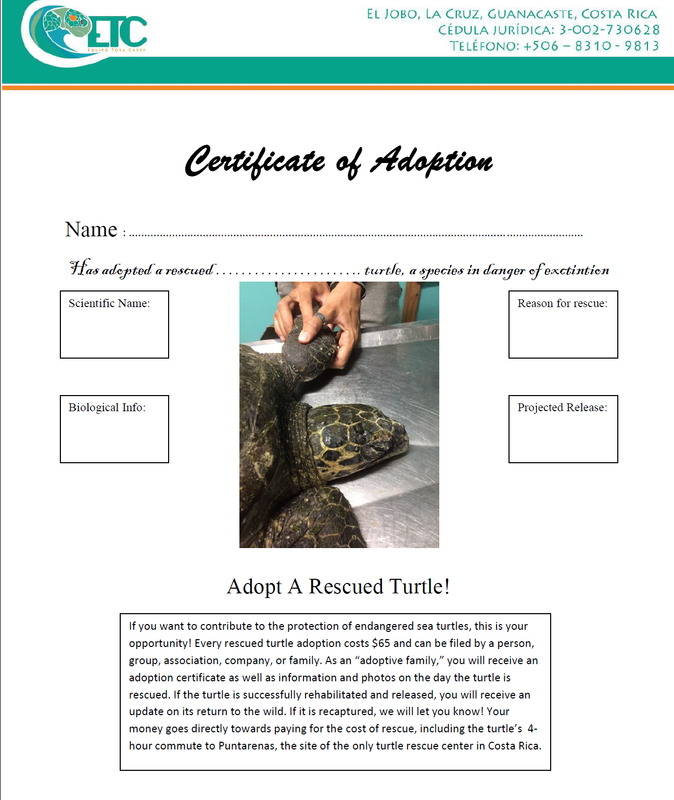 Upon this release, the person or family who adopted the rescued turtle will receive photos of the rehabilitated turtle being released into the wild.